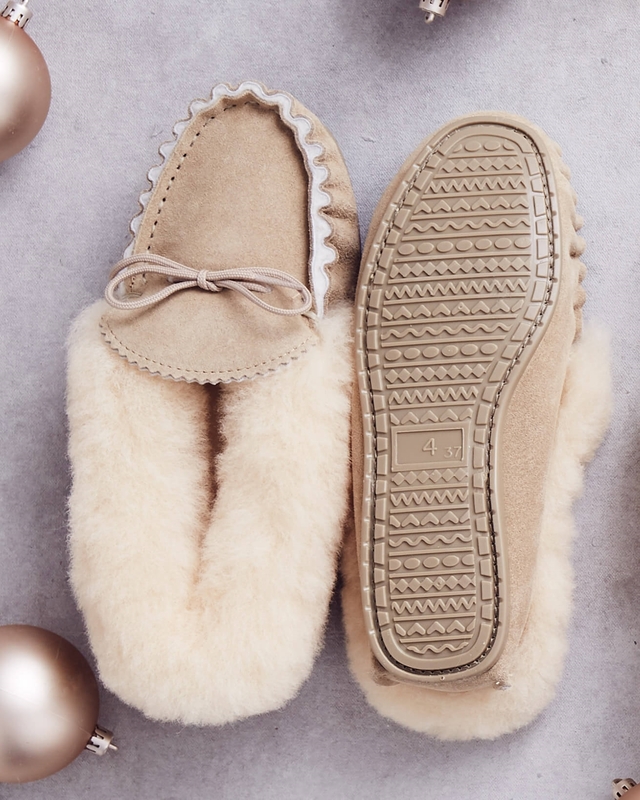 A true foot-pampering pleasure to come home to, our moccasins are traditionally handmade in England. From the craftsman’s selection of the finest suede to the hand-crimped edges, no machine comes close to making something so perfectly considered or so inherently special. Will it be our loafer with its matching suede cuff or the lounger with its luxurious shearling collar? rubber, ideal for popping outdoors. When trying on your footwear for the first time, it may feel very tight across your toes and instep. This is nothing to worry about, as within an hour or so of wearing, the boots or slippers will loosen off as the wool starts to bed down and mould to your feet. So do not order a size bigger than you usually wear, otherwise they will end up too big for you. If you know you are a half size – then we recommend buying the size down unless you regularly buy up a half size. Celtic & Co. products are made with the highest quality craftsmanship and sourced from the finest materials available. While these materials have been treated with premium dyes, some dye transfer may occur onto light clothing or furniture – as with any deep, richly dyed material. Thank you for sending me my new slippers. They are just as comfortable as the last pair that lasted a a good five years. They are cosy and well made. I can also take the recycle out due to the hard soles! Great quality and good value for money. These are fantastic slippers! Went looking for shearling slippers of superior quality and Celtic&co is definitely the place to go. I'm at home with a chronic illness and I wear my slippers all day long; got tired of investing in expensive felt slippers that wore through within a month or two. These are warm, are made thoughtfully with quality materials, true to size, and have durable enough soles to step outside in the winter. I'm thrilled! Lovely slippers just right for keeping by the bed - so easy to push my feet into if I have to get up in the middle of the night and brave a bathroom with a cold tiled floor. Not cheap, but excellent value as they last for years, as I know from experience!